Be sure you’re following Buggy and Buddy on Pinterest to keep up with all our latest art and learning projects for kids! I do purchase a few different papers depending on the activity we’re doing. 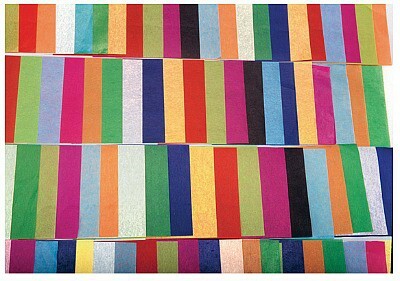 Construction paper in a variety of colors always comes in handy for crafting, creating, and even for making books. Lately I’ve been finding a good deal on construction paper at our local Costco. I also find this construction paper to be a good price on Amazon. Easel Paper: Even if you don’t have an easel, easel paper always comes in handy. You can tear it to any size which I love. (We used long pieces of paper for this DIY stamp mural.) The best deals I’ve found on easel paper are from Ikea (if you’re lucky enough to live near one) or use a coupon and buy it at your local craft store. You can also buy easel paper on Amazon. Newsprint: We always have newsprint around. 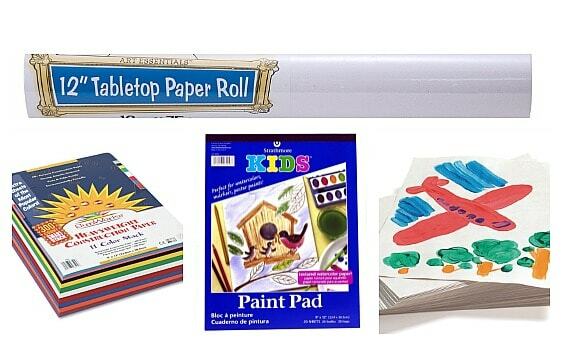 It’s a very inexpensive paper that the kids use often for simple projects like coloring, crafting, drawing, and writing. We always buy our newsprint from Discount School Supply. 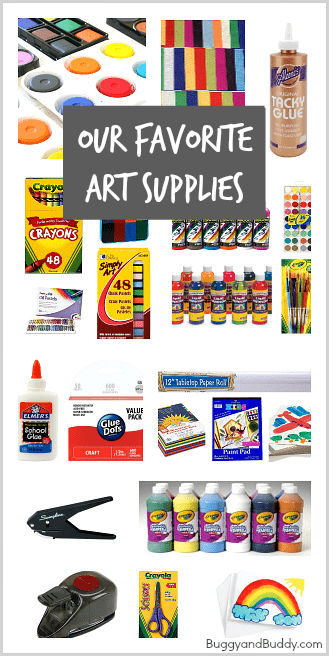 All-Purpose Art Paper: I just recently tried The Ultimate Art Paper and LOVED it! It’s so inexpensive and even holds up to watercolor paint! It’s also nice to have some Glue Dots on hand. 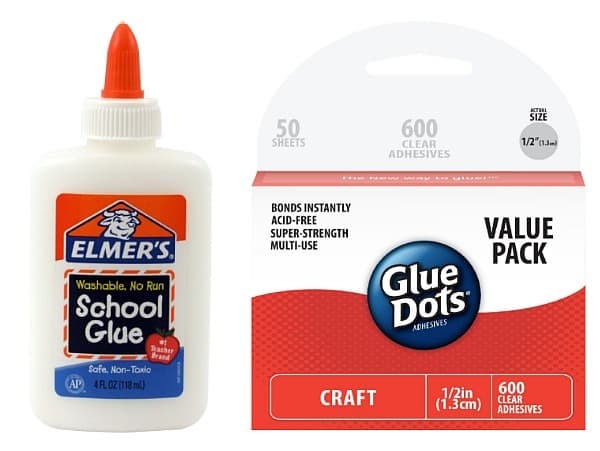 These have saved me many times when you have to glue something together in the middle of a project, and you don’t want to have to wait for it to dry before finishing the project. Oil Pastels: We also use oil pastels quite a bit like in our watercolor and oil pastel flowers. You can buy these at your local craft store or on Amazon. Chalk: Chalk is also a fun material to use! We just used it recently in our heart collage project. It always looks so vibrant on dark construction paper! You can use regular chalk or chalk pastels. You’ll definitely want a pair or two of kid scissors. You can find these are Target or online. We also love using paper punchers like a single hole punch or a large circle punch. We cut out shapes to use in projects often like with our toddler fall art. I love the Martha Stewart Craft scissors and use them when I’m cutting out things myself. They’re very sharp though, so not for kids. 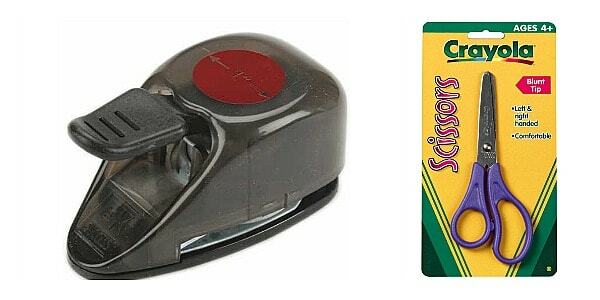 This Swingline single-hole punch is a lifesaver. It can cut through up to 20 sheets with hardly any pressure. I’m a huge fan of tissue paper! There’s really so much you can do with it! We crumpled up tissue paper squares to create texture on this flower craft. We also used it to make our these tissue paper flowers. You can buy the tissue paper already cut into squares or in full sheets. We get our tissue paper squares from Discount School Supply and full sheets of tissue paper I buy when I see it on sale at local stores. Watercolors: Our most frequently used paints are our watercolors. I have some watercolor cakes on hand when I just want to whip out a quick painting activity. Lucy is also able to get these easily on her own when she wants to paint. And we are also HUGE fans of liquid watercolors ! They are such great quality, so convenient, and can be used for so many things. We just recently used them in our salt and watercolor activity. 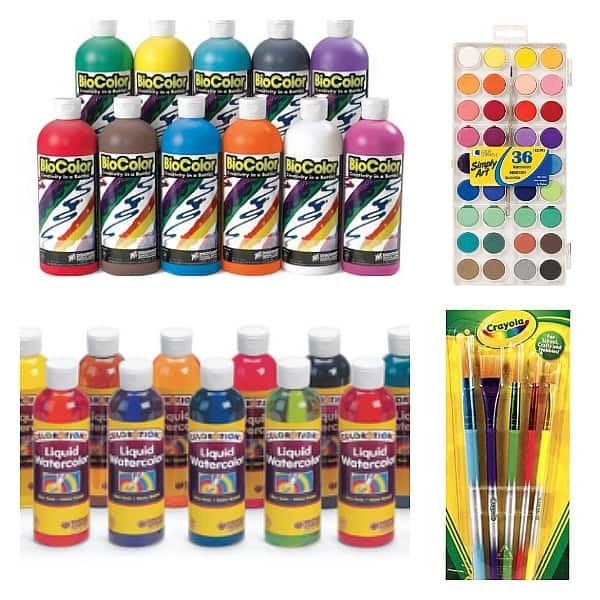 Biocolor Paint: We also have a set of the BioColor paints from Discount School Supply. Now what I like most about this paint is it doesn’t have the odor of tempera paint. We’ve used it for simple crafts like our homemade kazoos and stuffed apples, but it can really do so much more! 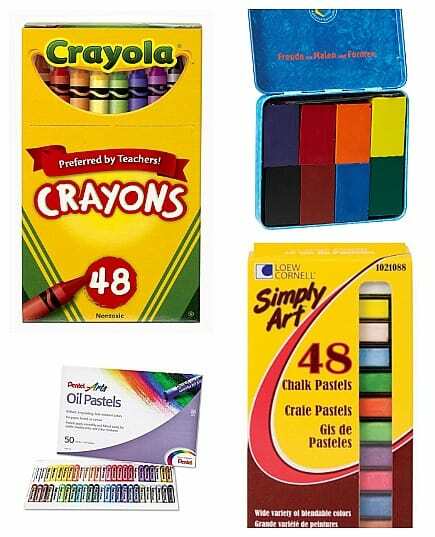 Tempera Paint: This Crayola Artista Tempera Paint is our absolute favorite! The colors are very vibrant, and it’s washable. Paintbrushes: It’s also good to invest in some paintbrushes. You can really get these anywhere. I try to be sure I have a wide variety of sizes for the kids to explore using. Sponges: And sponges are so fun to use for stamping. You can just buy regular old sponges from any store and cut them into shapes for stamping paints like we did in this Christmas craft. All the little extras like glitter, google eyes, craft sticks. pom poms, feathers, sequins, pipe cleaners, beads, ribbon, and buttons are really fun to use as well, but we definitely don’t use them all the time. I just keep my eyes open for deals on these items at our local dollar store or Target.